“Tai Chi Quan” means “supreme ultimate fist” in Chinese term, it can be refer as simply “Tai Chi” as well It was originated and gets much influence from both Taoism and Confucianism philosophy. Tai Chi basically represents the fusion of the Yin and Yang. Yin generally refers to feminine or dark and the Yang represents masculine or light. In Tai Chi’s philosophy, the fusion of Yin and Yang into an indivisible whole is often symbolized by the Taijitu as shown in the picture above. Today, Tai Chi Chuan has become very popular and spread around the world including Sydney. There are many arguments and speculations about the origin and creation of Tai Chi chuan especially with a Taoist called Zhang San Feng. Many believed that Tai Chi Chuan is formulated by him after witnessing a fight between a snake and a crane in Chinese Ming Dynasty. However, modern research has cast a serious doubt on those claims pointing out it should be understood as a political metaphor instead. In consideration of its wisdom and power, the origin of Tai Chi Chuan is actually beyond human to answer. Taoist Tai Yi Tai Chi was founded by a Taoist priest in Chinese Song Dynasty, and it is one of the unique courses offered at Kung Fu Republic. The core of Tai Yi Tai Chi is to think Tai Chi as a roundness dividing into two halves. Half is Yin and the other half is Yang, complementing each other. When in complement, one can reach balanced as a whole harmoniously. 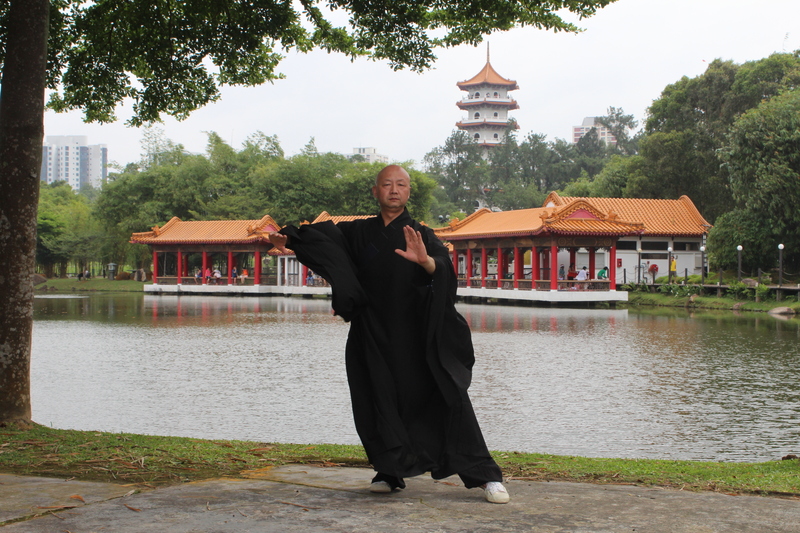 All the movement of Tai Yi Tai Chi emphasize in roundness. The whole movement of your body shall follow a continuous, circular and unending style. You can think like a reeling silk thread from a cocoon. Join our Tai Chi course to learn and experience the tremendous effect of this rare and prestigious of Tai Chi form, Tai Yi Tai Chi. First and foremost, you will be learning a solo routine known as forms. Tai Chi’s forms are mainly categorized into hand forms and weapon forms. With more than 150 forms in number, all the routines require their practitioners to be in calm, tranquil, relaxed and focus state of mind. These forms are practice in correspond with promoting longevity, health, losing weight or even sexual performance enhancement. While Tai Chi always portrait an image of exceedingly slow movements, many Tai Chi styles have secondary forms of a faster pace. It involves a lot forces and energy generated from the spine and waist. The energy is to transfer slowly and in a continuous manner before reaching your arms and legs. Medical studies of Tai Chi has support its effectiveness as an alternative exercise and a form of martial arts therapy. Besides health benefits, it also helps you in stress management as it brings you mental calm and clarity. It is also an important regimen for health preservation. Practicing Tai Chi Chuan also enables part of the cerebral cortex to enter a protective inhibition so that partial rest is possible while other parts are excited. As a result, various chronic diseases resulting from the malfunction of the nerve system can thus be cured or ameliorated. Sign up now with Kung Fu Republic to enjoy all these benefits and experience the wisdom lies within Tai Chi Quan.